Dirty Gold's Roar is the perfect soundtrack to the rest of your hot summer: they combine the carefree, relaxing, fingerpicking acoustic sounds of Jack Johnson and Dave Matthews with the relaxed and nostalgic atmospheres of Youth Lagoon and Magic Wands, they have lyrics that hit on just about every youthful and summery topic possible (relationships, "coming home," building a new life, and second chances,) and they produce five songs that could all end up being your favorite song of the summer. Writers will go on about how certain "summer albums" make you feel like you are at the beach, make you feel like you are by the pool relaxing, make you feel like you are falling in love for the first time, and even make you feel like the sun is shining directly on your face. 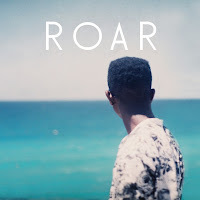 But the great thing about the sound of Roar and about all of Dirty Gold's discography on general is that their acoustic and atmospheric sound makes you feel all of those feelings on just about every song. Every song not only takes you to one place, one memory, and one dream, Roar can take you to multiple places, take you back to multiple memories, and make you dream of many new opportunities. And knowing we shouldn't think of Dirty Gold as a good summer band, but the summer band of every one of our nostalgic and youthful dreams.